When last we met, back on Saturday, we were in the middle of looking at the September 25, 1965 issue of TV Guide. But since I'd blathered on for so long about the lead story (see here if you've forgotten), it didn't leave much time for anything else, and there are some very neat things, particularly ads for the new season, that you'd probably like to see. So I've decided to carryover the discussion, which means that if you're here to see what the #4 show is in "Mitchell's Top Ten," you'll have to wait another week. I hope you can manage. *They would eventually go to color in 1967. And we wouldn't want to forget him, would we? A couple of stray observations: this week's cover story is a fairly snarky piece by Thomas B. Morgan as he accompanies Jackie Gleason and his TV family (and a couple dozen reporters) on their raucous train journey from New York to Miami Beach, where he taped his weekly variety show, to kick off the new season. I'm not a big fan of this type of journalism, which was seen frequently in TV Guide (as well as other magazines) in this era. There's a condensation to Morgan's tone, a sense that he's taking overheard conversations and trying to put them in the worst light, ridiculing them without the tone or style of, say, P.J. O'Rourke. Johnny Carson's celebrating his third anniversary as host of the Tonight show; could anyone have imagined there were, what, 27 more of these to go? It's not a clipfest as we would become accustomed to in years to come, just a regular show with Jerry Lewis and George Burns as guests. And finally, the jazz pianist Vince Guaraldi is the subject of the NET documentary Anatomy of a Hit, profiling the recording sessions for his new album, Black Orpheus, including the Grammy-winning hit "Cast Your Fate to the Wind." Guaraldi was a wonderfully talented musician - if the name doesn't sound familiar, perhaps this, his biggest hit, does. 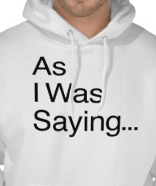 You might have heard it a time or two. There now, aren't you glad I spent one more day on this issue? 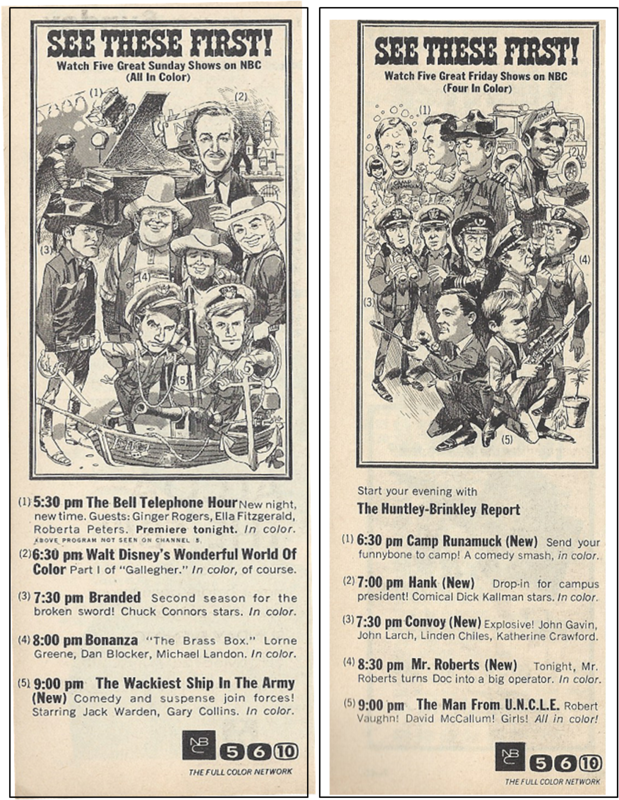 I'm a bit surprised that you didn't mention that NBC's fall promo artwork was done by Mad Magazine's Jack Davis (who you ought to be familiar with from his many TV Guide covers over the years). 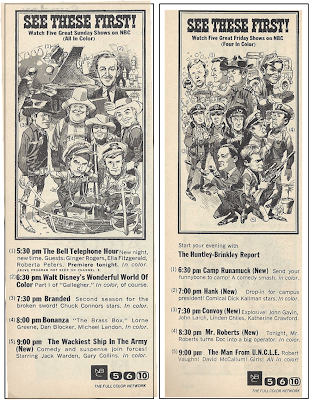 Go back a couple of weeks to the Fall Preview issue and you'll see a multi-page "mural" by Davis, covering NBC's entire 65-66 schedule. - That Sunday night ad for ABC does show the stations for Chicago and Rockford (chs 7 and 13, respectively). There's a hitch: Ch13 was only carrying The FBI on the direct Network feed. The other two shows were delayed: Voyage To The Bottom Of The Sea aired Thursday night at 6, and The ABC Sunday Night Movie was delayed to 10:30 that same night. 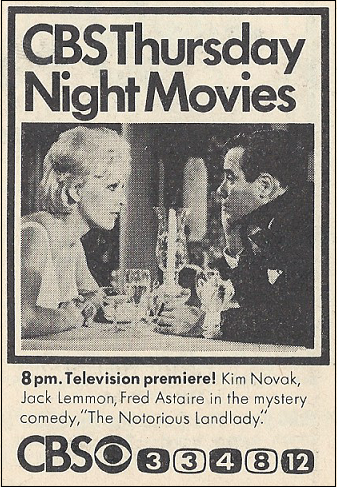 This was the first TV Guide to carry listings for Rockford's new station, ch23, which Carried Ed Sullivan and Perry Mason in their regular Sunday slots. Later in the year, Chs 13 and 23 reorganized, 13 getting all of ABC and 23 getting all of CBS. 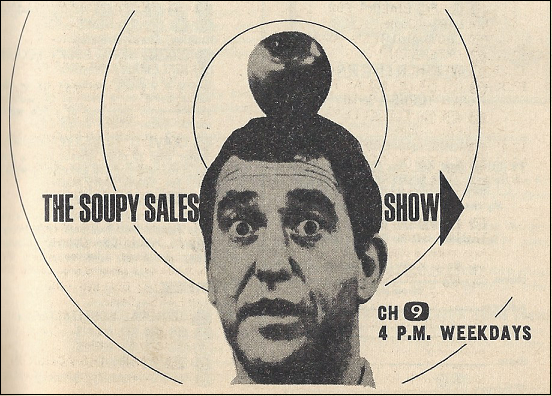 I can't give you the exact date because because a few weeks after this issue, TV Guide reorganized, and the Chicago edition became strictly Chicago, adding the new UHF stations for the first time. - I notice that you didn't include Dean Martin's new show in your variety comparisons. The Martin show was only a few weeks old, and the original producers were trying to do Ed Sullivan: Greg Garrison didn't take over for a few weeks yet. If that last name seems vaguely familiar, go back to your posting from April 27 of this year, and to my comment appended thereto. That was my memories of Susan Heinkel and her local kid show. As I mentioned then, agter after she became teenaged, Susan got another show called Susan And The Professor. Actually, John Yonely (simplified from a much longer Rumanian original) had been a popular entertainer in Midwestern nightclubs for years, with a Victor Borge-ish act built around his abilities with numerous instruments. Yonely (as Dino pronounced it, "Mister Yo-nelly!") looked a little like Gert Frobe, the actor who played Goldfinger; he maintained a deadpan throughout his act, which made it all the funnier. At this point, Yonely made the rounds of all available variety shows, including Carson, Griffin, and Douglas. Mike Douglas was a close friend; they'd worked together a lot in and around Chicago. John Yonely was a pilot; he flew his own plane to bookings all over the country. It was on on of those trips that he and his wife were killed, when his plane crashed into mountains on the way to Denver. You can find some of Yonely's TV appearances (including a couple of the Dean Martin spots) on YouTube. I don't know how many characters I have left, so I'll back off for now. Actually your joke that "people didn't watch ABC because they couldn't find it" is very accurate. 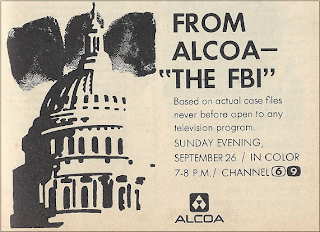 About a third of ABC's affiliates in the sixties were secondary affiliates. If those stations showed an ABC program at all, it was often before or after prime time (or even on weekends). 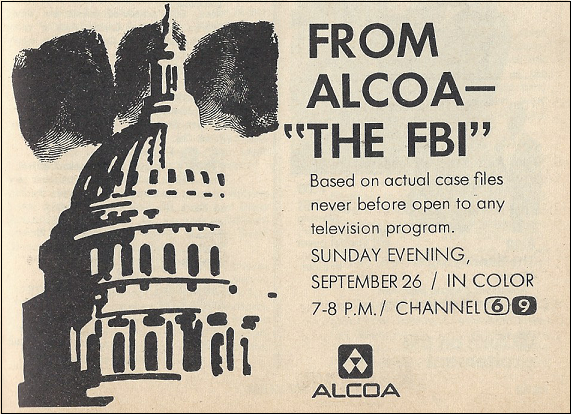 And at the end of the Alcoa sponsored episodes of THE F.B.I. Inspector Erskine leaves the building and strolls around Washington, drinking soda from an aluminum can. Mitchell's Top Ten, #5: What's My Line?